Don't Become a Victim of Change. Adapt and Thrive. It’s no secret, the health care industry is experiencing considerable change. Hospitals are under increased pressure to drive real and steady growth in order to remain healthy and relevant in the markets they serve. However, many are struggling to implement new revenue-generating strategies that thrive in the value-based era. 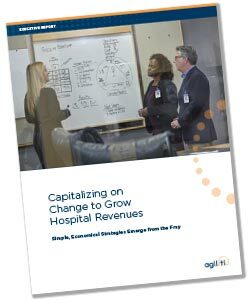 This report can help you learn how to better position your hospital for growth in 2017 and beyond. Complete the form to receive this Executive Report.